Two buddies keeping an eye on the passing scene on the South Main Street pedestrian promenade at The Shoppes, Chino Hills, California. Looks can be deceiving. This looks like a barbeque restaurant on a typical street corner, anywhere, U.S.A. As I was capturing the brackets I was also thinking that Judy and I would pay a visit to Lucille’s afterwards (we enjoy their ribs and chicken). After I captured the brackets for this image we moved down the street (on the sidewalk that is off the left edge of this image) where, after capturing some more brackets I was accosted by a security guard. It was then that I learned this was not a typical street corner in the United States (at least not yet being typical). 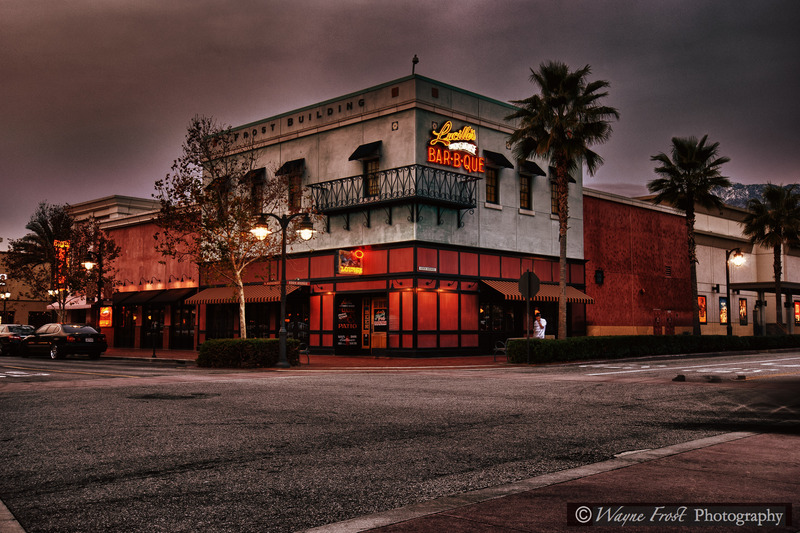 This branch of Lucille’s is located at the “out door shopping mall” known as Victoria Gardens in Rancho Cucamonga, California. The security guard who is apparently employed (either directly or through a subsidiary) by Forest City who developed and manages the venue, was telling me what I may and what I may not photograph at the venue from my vantage point on the sidewalk. I tried to use the rationale that I was on a public sidewalk, and thus could photograph anything I wanted, it was then that I was informed that I was on private property. I was told that I may photograph my companion for a “snapshot” but that I was not permitted to photograph anything or anyone else on the property. This just did not sit very well with me and I was getting quite worked up about it, but Judy more or less dragged me away, packed me in the van and we left the venue. Not happy with how all that went I then did some research with the city of Rancho Cucamonga and learned that the streets and sidewalks that comprise Victoria Gardens, although inter-connected to the surrounding public streets and public sidewalks, and even though not equipped with any physical barriers or other restriction to access, are still private property and there is no implied or mandatory public easement. So despite the fact that the venue looks like just another commercial district within a given municipality, with streets, sidewalks, blocks of free standing commercial structures and adjacent parking lots (including “street parking”) this is not a typical American neighborhood and the “rules” are quite different from my own, home neighborhood. You really should reconsider one of your policies that impacts guests on your premises. I was made to feel very unwelcome at Victoria Gardens this past Tuesday evening. I was sitting (in my power chair, I am disabled) on one side of a street on your property, photographing a business across the street (the building was replicating early to mid 20th century architecture, and they had a retro-looking neon light that had caught my eye). I was approached by a security person (who maintained his professionalism throughout the entire contact) who told me I could take a personal photograph of my wife standing in front of the building, but that I was not permitted to take any pictures that did not have someone I knew in them. You can’t call a policy like that as being about homeland security, it is all about a commercial enterprise claiming the right to control use of their image, whether the image captured identifies the owning entity or not, no matter what the context of the image captured might be. I understand that a commercial enterprise has the right to protect its assets, but one of the primary assets of a shopping mall is the good will of the public who would chose to do business with you. It is ironic that as the developers and management of this property you do everything you can think of to entice the public to visit your facility, which includes public spaces that encourage lingering, and then you run off a member of the public who has responded to your efforts. As noted previously, the security officer behaved professionally and I commend him for his patience and professional handling of the situation. When I challenged his authority to restrict my photography on a “public street” he confirmed with his supervisor that we were on private property, as the street is your property, which may be true but I am wondering what implications, if any, there are surrounding an easement for the passage of the public through the property. I knew then that your company was asserting its rights, but It still did not sit very well with me and I informed him that he should tell his management that I had previously been happy shopping and dining on the property and probably would have done so again in the future, but that youe company’s asinine policy had changed all that. Sometimes a corporation’s right to totally control how their assets are used should be tempered with some common sense and human kindness. What was lost on the conscience of your company was that this all started out because I enjoyed the ambiance of your venue and wanted to capture a small fragment of that to share with others. Now you have gone and spoiled that. I also emailed a general inquiry about photography policies to about a half dozen other specific venues or management companies, trying to ascertain if I would be welcome to capture photographic images and use a tripod. One responded no, altogether on all of their managed properties, one responded with some restriction and the others have not responded. In contrast to all of this, The Huntington, in San Marino, California, where I have captured images before, actually has a very welcoming and reasonable photography policy. To date, my email to Forest City has not been responded to. I can only surmise that Forest City, if they know I exist at all, they perceive me as just a pesky gnat, and I have no impact on their bottom line. I also know that I could have handled myself differently, and I know from reading other photographers’ postings that probably the best course of action in these circumstances is to try and get your shots unnoticed in these quasi-public venues, and if noticed, be gracious and don’t “rock the boat”, which will be my tactic in the future. Having recounted all of the above, it still does not sit well with me at all, that corporations do have so much power over the public, that they might, through their asset holdings capture more power and influence over us as individual Americans. The Supreme Court decision last year that essentially gave corporations rights equal to the rights given to individual human citizens could actually portend the beginning of the end of freedom and liberty for American citizens. I will carry on with my life, and while I may never choose to visit Victoria Gardens ever again, I will continue to enjoy the beef ribs and chicken at the Lucille’s Barbeque in Chino, California, where I won’t be accosted if I am using my camera outside.